Over the past few years, I’ve learned so much about minerals and how critical they are in order to live your healthiest and happiest life. Copper, chromium, phosphorus and molybdenum are examples of important minerals we need, but I think at times we get intimidated by their names and possible associations. Pennies, for example, used to be mainly made of copper, and today they are made of zinc, another necessary mineral! I’m not suggesting you snack on pennies of course! My goal is to expose you to the world of minerals, the forgotten nutrient. Another mineral I want you to get very familiar with is magnesium. Calcium and vitamin D are critical for bone health, but you may not know magnesium possibly also plays a huge role in keeping bones strong. Researchers who conducted the magnesium study examined 2,245 men between 42 and 61-years-old and measured their serum magnesium levels, which provides the amount of magnesium in the blood as opposed to the blood cells. Variables such as age, history of smoking and alcohol consumption and medical history were all taken into account. At the beginning of the study, the average magnesium level of the men was 1.98 (0.15) mg/dl, which falls within the standard range of 1.7 to 2.2 mg/dL. Only 136 of the men had hypomagnesemia (low level of magnesium), and only 22 of the men had an excess amount of magnesium. After following up with participants more than 20 years later, there were a total of 123 incident fractures. The 22 men who had excess magnesium had no fractures, and “participants in the top quartile of serum magnesium concentrations had a decreased risk of both total and femoral fractures.” In fact, the risk of having a fracture went down by 44 percent in the men who had higher levels of magnesium. The study concludes there is much more research needed, but the main takeaway is it’s important to have a good balance of minerals, like magnesium, in your body. 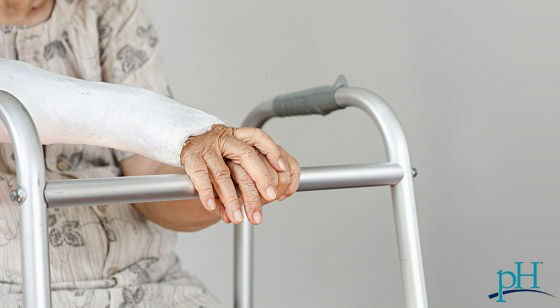 Broken bones may seem like minor issues compared to conditions like cancer and dementia, but fractures in the aging population are a public health concern that requires us to be proactive. Kaiser Permanente reports women between the age range of 65-69 who break a hip are five times more likely to die within a year compared to women in the same age group who do not break a hip. Magnesium may also be effective in regulating blood pressure, which disproportionately affects older people. Good sources of this mineral include leafy green vegetables, legumes, nuts, seeds and whole grains. Foods with fiber are also good sources of magnesium, and many cereals are even fortified with magnesium. Ask your doctor for a blood test that will measure magnesium levels along with other essential vitamins and minerals. For more information on nutritional testing, click here.